Every single piece of existing technology on this planet has a buyer. Not every piece of technology is the same, and not all buyers are the same. Some can afford more, some less, some do careful research before they make a decision, and some just buy whatever is the latest, whatever is the hype and, of course, what looks impressive. So, what kind of a buyer should a small business owner be? Sure, small business owners need to be very careful about their budget and that is completely understandable. Every penny is important and should be important if you want your company to thrive and succeed. This is something startups know too well – distractions are kept to a minimum while the focus is solely on the business itself. However, in case you run a small business that has long passed its startup days, you should seriously reevaluate your work environment. Without a doubt, IT infrastructure should be on the top of your list. Setting up a reliable business network is crucial for your business as the communication, efficiency, productivity and operating costs will heavily depend on it. Things like servers , routers, firewalls and switches are doing amazing things for your business, such as protecting your data and enabling efficient communication among your staff members and with your clients. Simply put - there is no business without a business network. However, this technology is not visible to your employees. They will notice if something's wrong (as will your clients), but they don't have a contact with this technology on a day-to-day basis. For your employees, other, visible things are more important – the tools they use to do their jobs. This is why we already helped you choose the best office printer (link to best office printers page), and now we'll help you choose the right work monitor for you and for your staff by providing useful tips that will help you get the most out of your monitor setup. What Monitors Are Good for Business? You've probably already read too many articles about all the ways a desk job might be ruining your health, so as a business owner you have the responsibility to protect your employees by eliminating harmful factors to the best of your ability. Therefore, choosing the best computer monitor for your office will be one of the wisest and most important moves that you are going to make. These features are meant to ease the nasty consequences of long working hours, such as eye-strain and blurred vision, headaches and neck-stiffness. When looking into best computer monitors for office work, think about the size and number of monitors each user will need, the number of hours each staff member spends in front of the screen, and the type of business, i.e. work you and your employees are performing on a computer. What Size Monitor to Buy for Office & How Many? Requirements of a SEO, operations manager, designer, developer, accountant and an operator are different, so in a diverse team, getting a different setup for each group of employees would be a cost-effective move to make. Analyze the requirements of your team and tasks they are preforming, and you'll determine the monitor setup for your business. If you determine that your whole staff or certain members of your staff need a multi-monitor setup, you should go with 24" for 2 monitors and up to 22" for more than 3 monitors. Multiple monitors require more space, so you need to make sure your employees have plenty on their desks. Moreover, having multiple monitors requires an additional specialized hardware, either a motherboard with a multi-monitor support or a GPU (graphics processing unit), which makes this kind of setup more expensive. If you do choose the multiple-monitor setup, always go with the bezel-less displays. Monitor bezels are not very important in case you are working with one monitor, but with multiple monitors they become quite noticeable. If you combine 2 or more monitors with minimal bezels, it will be less annoying, and you'll get a better and more precise view. If your employees don't need multiple monitors, make sure you don't choose computer monitors that are too small and too difficult to preform work on efficiently. Nowadays, a 24" for a single-monitor setup is pretty much a standard. It's no coincidence, as it provides plenty of room for office work, enables easy multitasking or comparing multiple things with high-level of transparency. However, if you feel you need more space than that, 27" would be the way to go, especially if you are working with Adobe products or AutoCAD. What Type of Monitor Panel is Best for Office Work? To help you better understand your screens, here are the main differences between IPS and TN panels. IPS panel offers much better viewing angles (178 degrees, to be more precise), meaning that you'll be able to look at the screen from shallower angles and still be able to have a clear look of what's on the screen without any color degradation. The colors are much clearer and natural, so the quality of image is not just a better option for content creation (image or video editing, graphic design), but also for regular day-to-day work, because it delivers a better overall experience. TN panel is considered a lower quality due to the lower screen resolution (up to 2K, rarely 4K) color accuracy and lower viewing angles. However, if you are usually sitting dead straight in front of the monitor and don't depend so much on the color accuracy (e.g. working with text or excel documents and data), then TN might be good enough. Especially if you take the price into consideration. Namely, TN is easier to produce, so the monitors are much cheaper. Another advantage is faster response time and higher refresh rates. For comparison, while the fastest IPS panels struggle to get below 10ms, TN's response time can be as low as 1ms. On the other hand, the faster response time and higher refresh rates won't make much of difference for a regular office environment and won't be noticeable during the "normal" usage (usage that doesn't involve gaming). How Many Hours a Day do You Spend Working on the Computer? This is where the refresh rate and screen resolution can make a huge difference. These two features are something that gets overlooked almost all the time, because no one really takes into consideration the total time that a worker spends in front of the computer screen. Important fact for you to know is that a computer monitor with anything below 60Hz refresh rate will cause progressively increased eye fatigue and headaches. So not only will you get a poor overall PC experience, but it will influence the quality of your life. A person that spends just a couple of hours a day working on a computer might not feel these consequences, but a person that spends more than 6 straight hours of looking at the screen will surely feel the difference between 75Hz and less than 60Hz. As for the resolution, always always always go with 1080p minimum. 2K, UHD & 4K monitors have even more pixels, which means that the image will be crisp and very pleasant. 4K monitors will really unload the stress from your eyes and relieve you of that nasty headache. One thing to be careful about, however: a lot of UHD/4K monitors come with a lower refresh rate and IPS panels. Always check the refresh rate and make sure it is at least 60Hz. In some cases, 54Hz would work as well, just make sure you never go below that. If you start googling 'best computer monitors', you'll notice that the top and majority of results are for best gaming monitors. So, you might wonder: can gaming monitors also be used for business? If you feel like a 4K monitor would just be too much for you or your staff, but at the same time, you'd like to make sure everyone has great screens with 0 chance of a headache, our Secure Networks ITC Senior IT Consultant suggest that you should focus on gaming monitors. "Gaming monitors are always overlooked when it comes to business-class monitors which is just plain wrong. Namely, gaming hardware is designed to handle stress and it offers the best from the best. Gaming monitors are mostly TN panels, which are lower quality than IPS when it comes to viewing angles and color accuracy, but they offer much higher refresh rates. You can expect a standard of 120Hz and up to 144Hz from these monitors. The higher the refresh rate, the more FPS (frames per second) you'll be able to see. This will match the speed of your eyes and make the computer experience more soothing." Now that you've learned that you and gamers have more in common than you thought, finding the best monitor for work should be a much easier task. When reviewing the specs, keep in mind the important questions and answers that we presented and look for features that will be extremely beneficial for you and your employees, such as Flicker Free Technology, Ultra-low Blue Light Technology and ergonomic design. Since the total cost of ownership will also be something to consider when making the purchase, we created the list of Top 5 Best Business Monitors ideal for a small business that's on a budget but wants to provide good monitors for the employees. 4 out of 5 monitors are under $200 and are chosen based on the features most employees today that spend long hours in front of computer screens would benefit from. The remaining monitor is just little over $200, but it will make any office desk look really cool. The ASUS VG245H is one of the most impressive monitors on the market for under $200. Some of the features worth mentioning are AMD FreeSync technology, which eliminates screen tearing and choppy frame rates, 2 built-in speakers and 2 HDMI ports, and impressive image quality and vibrant colors deliver a pleasant and positive work experience regardless of the type of work. The screen is crisp and responsive, with no smearing, ghosting or motion blur. However, some features will interest you more in case you are not shopping the monitor specifically for your content creation team. The VG245H uses a Flicker Free Techology, which means that the screen minimizes eyestrain and other damaging eye ailments when siting long hours in front of the computer. It also uses Ultra-low blue light technology that reduces amount of harmful blue light. You'll even be able to choose between four different filter settings onscreen and choose the most suitable one for you. Finally, the VG245H has a highly-ergonomic design, which is another feature that will help ease head, neck and shoulder discomfort caused by all those long, endless office hours. Monitor mobility: full tilt (33 degrees backwards and 5 degrees forward), swivel (90 degrees to the left or right), pivot (pivot vertically into portrait mode) and height (5" up and down) adjustment to find ideal viewing position. Thanks to its design, the Philips 246E9QDSB/27 is a perfect addition to any office that cares about style and making an impression. It features an Ultra Wide-Color technology that delivers a wider spectrum of colors and produces more natural-looking greens, vivid reds and deeper blues. It brings media entertainment to life, so it is an excellent choice for content creation and professional apps that demand color accuracy and consistent brightness. The Wide-view technology enables image and color accuracy by providing extra wide-viewing angles. This monitor is not only suitable for content creation, but it provides an amazing and enjoyable over-all user experience for web browsing or dealing with any kind of work that involves more than working on text documents. The 246E9QDSB/27 also features AMD FreeSync Technology for quick and smooth refresh and ultra-fast response time and enhanced full HD for crisp image details. Its ultra-narrow borders allow minimal distractions and maximum viewing size, so this model is especially suited for multi-monitor setup, as it provides an experience of using one large display instead of multiple ones. The most important features of the 246E9QDSB/27 monitor for any person that spends a lot of time in front of a computer screen is the Flicker-free technology that ensures comfortable viewing and less eye fatigue, and LowBlue smart software technology, developed for user's wellbeing as it reduces harmful blue light. The monitor can also be tilted 5 degrees forward and 20 degrees backward for more comfortable viewing. And what you all nature lovers out there would be happy to learn is that this model is 100% eco-friendly. The monitor is lead- and mercury-free, and all body plastic parts, metal chassis parts and packaging materials are made from 100% recyclable materials. Designed by design house Studio F.A. the AOC PDS241 brings together a slick contemporary and functional design that make it look like no other monitor on the market. It is almost borderless on three sides and it has the thinnest panel in the world – it is only 5.2 mm thick which makes it slimmer than your smartphone! The monitor has an elegant, curved asymmetrical silver metal stand and a larger breakout box that includes the power port and a full-size HDMI port. Since the monitor is so thin, it doesn't have built-in speakers, but it does have a headphone jack, so you will be able to plug in external speakers or your headphones. It also has only one HDMI port which many perceive as a downside, but that will be quite enough for office work. Not only is the AOC PDS241's luxurious style aimed to impress business partners or clients, it also has some excellent features which make it a perfect monitor for office work. Namely, it features really wide viewing angles; the LowBlue Mode technology which decreases potentially harmful blue light which keeps your eyes safe during long exposure hours; the Flicker-Free technology makes flicker unperceivable for more comfortable and strain-free viewing; the SuperColor technology enhances the color spectrum for more vibrant and vivid images but doesn't reproduce colors to a professional standard, and ClearVision technology. The monitor also has a matt anti-glare coating that won't leave fingerprints or smudges and can be tilted 3.5 degrees forward and 21.5 degrees backward, with no twisting or rotation possible. 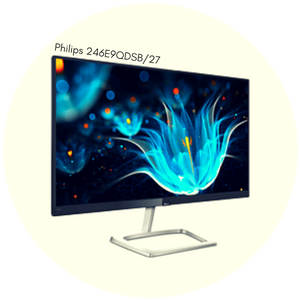 In case you don't heavily rely on color accuracy and image quality, but you would use this monitor for general work (not serious content creation), and you'd like to have a simple, effective and impressive, one-of-a-kind monitor, then this one is perfect for you. The Philips 257E7QDSB has a lot of neat features that the previous model does, such as the Flicker-free technology which regulates the brightness, reduces flicker and eliminates eye fatigue, and crystal-clear picture quality with stunning detail. 5-degree tilt forwards and 20-degree-tilt backwards are also possible for finding the best suitable viewing angle. The large viewing area and clear images make it excellent canvas for graphic design or simply day-to-day multitasking operations. The narrow-border display maximizes the viewing size, which makes this model excellent choice for multi-monitor setup. Philips takes care of the environment, so this model is also lead- and mercury-free with 100% recyclable packaging material and is designed to use less energy. The 257E7QDSB model also uses SmartImage Lite technology that analyzes the content displayed on your screen and dynamically enhances the contrast, color saturation and sharpness – all in real time. The difference between this and 246E9QDSB/27 model is the MHL technology that this model offers. The MHL technology is meant for enjoying your smartphone content on a big, full DH screen. You can simply connect your mobile phone or other portable devices with the monitor and you'll be able to work on your smartphone content on the big screen. The AOC i2769Vm monitor features a 2mm ultra-narrow bezel that provides a virtually borderless appearance. The design makes it ideally suited for dual- or multiple-monitor setups, and represents an ultimate combination of style, performance and affordability. The MHL technology allows you to access your smartphone or any portable device and work on its content on a full HD screen with full digital sound. The technology also has a practical side to it – you'd be charging your phone while connected. The built-in speakers enable you to quickly catch up with your associates or team members without the hassle of connecting external speakers. The wide viewing angles allow you and your colleagues to clearly see whatever is presented on the screen from wherever they stand, and brilliant colors provide an astonishing overall user experience no matter the work. The monitor also features the Flicker-free technology that prevents eye straining and headaches, and it enables you to slightly tilt it forward (5 degrees) or backwards (15 degrees). Getting a good computer monitor for your office will increase the efficiency and productivity of all employees, so that's why we'll help you get the best from the best, within your budget. Secure Networks ITC has been providing Managed IT Service & Support for Small San Diego businesses for more than 15 years, so there's a 120% chance that we'll know exactly what you need as soon as you call and introduce yourself. Our IT Consultants & IT Sales Experts will work together to find ideal monitor setup and solution for your business, while our Field Technician will be sent to your office to deliver and install your new office monitors for each user. If interested in discussing about your entire IT infrastructure, ask for our IT Consultant and FREE initial assessment!